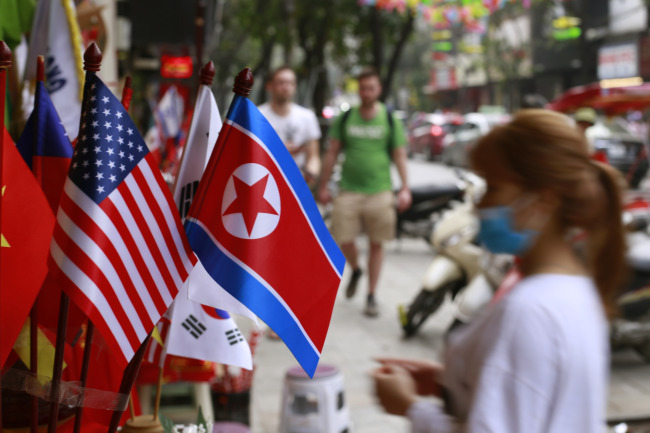 US and North Korean negotiators concluded their talks in Pyongyang, agreeing to meet again before the second bilateral summit slated for later this month, the State Department said Friday. US Special Representative for North Korea Stephen Biegun was in the North Korean capital from Wednesday through Friday for pre-summit talks with his counterpart, Kim Hyok-chol. US President Donald Trump and North Korean leader Kim Jong-un are scheduled to meet in Vietnam Feb. 27-28. The two envoys "discussed advancing President Trump and Chairman Kim's Singapore summit commitments of complete denuclearization, transforming US-DPRK relations, and building a lasting peace on the Korean Peninsula," the department said in a statement, referring to the pledges made at the first summit in June. "Special Representative Biegun and Special Representative Kim agreed to meet again in advance of President Trump and Chairman Kim's second summit." This week's negotiations were aimed at hammering out the logistics and agenda for the second summit. Biegun said ahead of his trip that he would discuss the "corresponding measures" North Korea is seeking in exchange for its denuclearization. The State Department said Kim Hyok-chol is the special representative for US affairs of the State Affairs Commission, revealing his title for the first time. Kim was appointed to the role recently after previously serving as Pyongyang's ambassador to Spain.